A new protective coating for silicon mirrors based on microelectromechanical systems (MEMS) allows precision cutting and welding with high-power lasers. Up to now, it has been possible to use these small mirrors only with laser outputs of a few milliwatts. This was enough for head-up displays on car windshields, but not for laser cutting and welding, because higher outputs would have melted the mirrors. Along with a special mounting, the new protective coating allows the mirrors to withstand laser powers in the kilowatt range – enough to process aluminum or sheet steel used in automotive and aerospace manufacturing. The system was developed jointly by engineers at the Fraunhofer institutes for silicon technology (ISIT) in Itzehoe and material and beam technology (IWS) in Dresden. 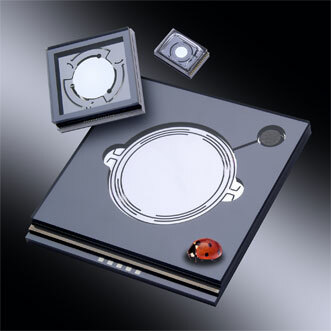 MEMS mirrors deflect the laser beam and guide it precisely over the workpiece. Now they can withstand even high laser powers, enabling them to process aluminum and sheet steel. Courtesy of the Fraunhofer Institute for Material and Beam Technology. A major advantage of thin MEMS mirrors is that they can be swiveled back and forth at extremely high speeds, reaching frequencies of up to 100,000 Hz. This allows the laser energy to be distributed much more effectively than with conventional laser systems, whose mirrors swivel at only around 1000 Hz. Lasers have a specific energy profile in their focal point and always input the same amount of energy. If the mirror swivels slowly, the energy cannot be distributed and dosed as effectively at the weld. "By contrast, rapid oscillation of the laser beam allows us to distribute the heat and adjust it to the respective processing task much more effectively," said Dr.-Ing. Andreas Wetzig, a specialist in the laser ablation and cutting department at Fraunhofer IWS. "We can weld together aluminum and copper, for example, and use the heat input to precisely control which metal heats up more and thus makes up more of the melt," he said. The mirrors also make it easier to weld aluminum alloys alone. At present, aluminum weld seams are often porous because certain substances outgas from the alloys and form bubbles during the welding process. With the micromirror, heat input can be controlled so that the melt remains liquid until the substances have completely outgassed. Although current solid-state lasers can cut metals very well, the cut edges do not match up to the quality achieved by CO2 lasers. Targeted heat input using MEMS mirrors improves edge roughness and avoids burr formation on the underside of the cut edge. Normally MEMS mirrors have a diameter of 1 to 2 mm. The new MEMS mirrors have diameters of up to 2 cm, enabling them to handle lasers with larger beam diameters and significantly higher output. For the developers, the challenge consisted in achieving high frequencies despite the size. "To address this issue, we operate the mirrors in air-evacuated vacuum pods in order to minimize attenuation of the oscillating mirror," said Dr. Ulrich Hofmann, a MEMS mirror expert at Fraunhofer ISIT. The researchers plan to present their work at Laser World of Photonics later this month in Munich. For more information, visit www.iws.fraunhofer.de.